Ringmat Feet are a vibration control product for the base of your hi-fi and home cinema equipment and speakers. They represent another innovative product from the designers of RINGMAT and STATMAT. And any other item of hi-fi or home cinema equipment. picture as well as the sound. That’s why Ringmat Developments has designed another product to help you get the best possible sound and picture during playback – RINGMAT FEET. 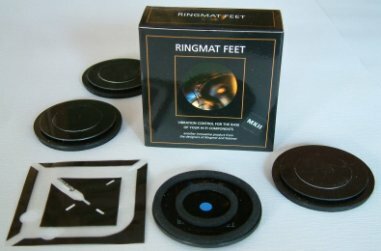 RINGMAT FEET control and disperse the mechanical and electrical vibrations that would otherwise spoil the sound quality of hi-fi and the sound and picture of home cinema systems. These vibrations are natural by-products of any hi-fi or home cinema system, and they cause loss of information and signal phase distortions. RINGMAT FEET minimise the effect of these vibrations. You’ll notice the difference immediately. Just place Ringmat Feet under each foot of a hi-fi component and hear your music come to life! Constructed from a careful selection of materials, RINGMAT FEET work in much the same way as a RINGMAT, controlling the mechanical vibrations and the effects of resonance by decoupling equipment from their support surfaces and dispersing vibrational energy into the air in and around the FEET. electromagnetic fields) are also noticeably reduced. This is achieved by decoupling electromagnetic fields by breaking the contacts between the equipment and their support surfaces. The problem with mechanical and electrical vibrations is that they corrupt the signals by introducing phase errors and therefore contaminate the sound of hi-fi systems and reduce the picture quality in home cinema systems. By using RINGMAT FEET, the result is a cleaner, crisper sound, that’s far more musical and closer to the original recording, and in the case of home cinema systems, an improved picture. Since their launch in 1999, there have been constant design improvements in the materials used to make RINGMAT FEET. Nearly all the materials used have now been changed to ones that work to a higher specification, and with each change an improvement in sound quality has usually resulted. No other form of component support matches RINGMAT FEET. From the beginning of 2005, the range of RINGMAT FEET available expanded from 2 to 5. RINGMAT FEET are constructed according to core Ringmat principles of dispersing vibration into the air in a controlled manner without oscillation. They consist of an arrangement of discs and concentric rings, very much like RINGMATS. Principally, there are two plastic discs between which are a cork ring and a thicker poron spiral spring within that ring - poron is a rapid recovery material used in the aerospace industry. There are two foam rings under the lower disc and the cork ring on top of the lower disc flexes the lower plastic disc between the foam rings. On the top is a smaller, centrally placed, plastic covered steel disc that flexes and pressures the top plastic disc within the cork ring below. used, the thickness and density of the foam and the thickness of the cork rings and poron spirals, and the number of poron spirals to achieve to appropriate blend for each weight range up to 69 kilos. There are variations in the weight ranges according to the number of RINGMAT FEET used. Of course, this has to correspond to the number of ‘feet’ or cones used under the item of equipment to be supported, or, for example, the number of RINGMAT DOMES used in place of the equipment’s own feet (or where the equipment has no ‘feet’ of its own, such as may be the case with loudspeakers). CHEETAH and TIGER Feet are exceptionally fast and agile, providing far greater resolution & dynamics in the sound when used in a hi-fi or audio-visual system, and also an improved picture in the case of the latter type of system. The same attributes will also be found in JUMBO and MAMMOTH Feet, but under much heavier weights. There are two versions of JUMBO Feet: INDIAN for component feet up to 45mm across (or Small Ringmat Domes) and AFRICAN for larger feet (or Large Ringmat Domes). The weight limitations given for each type of RINGMAT FEET are approximate and depend on the nature and shape of the equipment’s own ‘feet’ or other type of immediate support under the equipment. If these provide a relatively small area of contact with the top of the FEET, thereby increasing the weight bearing per square mm, the quoted weight bearing limitations for a particular set of RINGMAT FEET will need to be reduced accordingly. For best results where cones are used, the smaller contact area, or ‘point’, should be uppermost under the equipment itself, not pointing down into the support surface below. To avoid oscillation, one RINGMAT FOOT in any set of 3 or 4 FEET operates in a stiffer fashion to the others in the set. The same approach is used for RINGMAT DOMES. Contrary to expectations, the stiffer RINGMAT FOOT (or denser RINGMAT DOME) should always be used under the least weight bearing corner or other support area of the item to be supported. RINGMAT FEET must rest on a flat surface. Usually, this would be a hard surface, such as found with shelves and floors, but some users report that they have achieved very good results on carpet. However, with some carpets there could be difficulty in keeping the Statfeet flat. With each set of RINGMAT FEET there is one STATFOOT, which is a square of our patented anti-static film. The STATFOOT is to be used beneath one, but only one, of the RINGMAT FEET in accordance with the instructions included with each set of FEET. STATFEET can also be used on their own by placing them under one, but only one, ordinary foot of each component, which can include loudspeakers as well as electrical equipment. STATFEET not only improve the sound but also the picture quality in home cinema systems. STATFEET can therefore be used separately throughout the reproduction system and for economy they are available in packs of 6. Moreover, one STATMAT used on top of another in the same position increases their power, and therefore their performance. For more information about STATFEET, click here. base plate or otherwise causing possible damage. RINGMAT DOMES are made of compressed cork with a domed top and flat bottom and are far superior to conventional cones. For more information about RINGMAT DOMES, click here. RINGMAT FEET and RINGMAT DOMES can be used on their own but used together they produce an even better result. RINGMAT FEET are one of a family of Ringmat products that effectively reduce information loss and phase distortion. Much of this information loss and phase distortion comes about through mechanical and electrical vibrations in sound and home cinema reproduction systems. Ringmat Developments is continually researching new techniques in its quest to eliminate these unwanted vibrations. To order your RINGMAT FEET or to discuss your requirements, contact your local dealer, supplier or Ringmat Developments.